A recent project was completed in December 2013 at Spencer Street, Essendon using decorative mouldings within the hard landscaping for the garden areas. 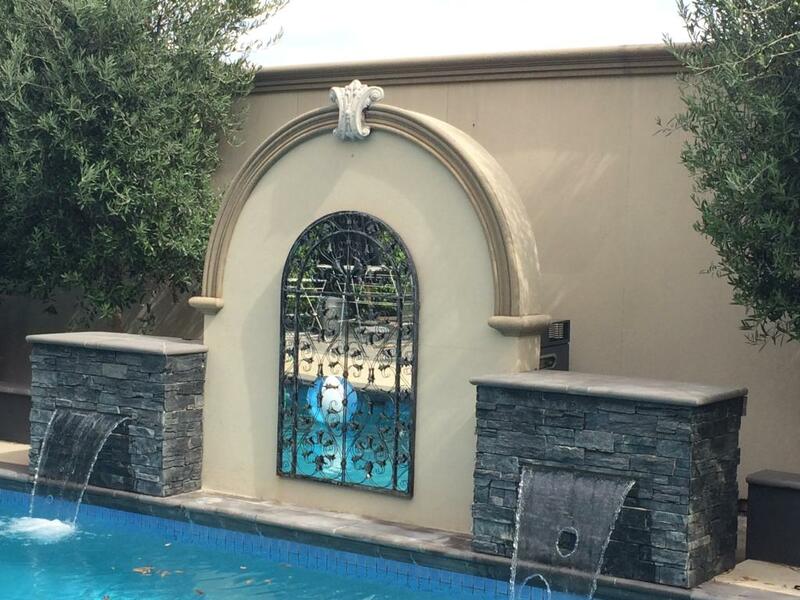 A decorative arch at the edge finishes the pool with a luxurious Mediterranean look. The arch features decorative moulding and a mirror and is set between two low stone walls which are water features. 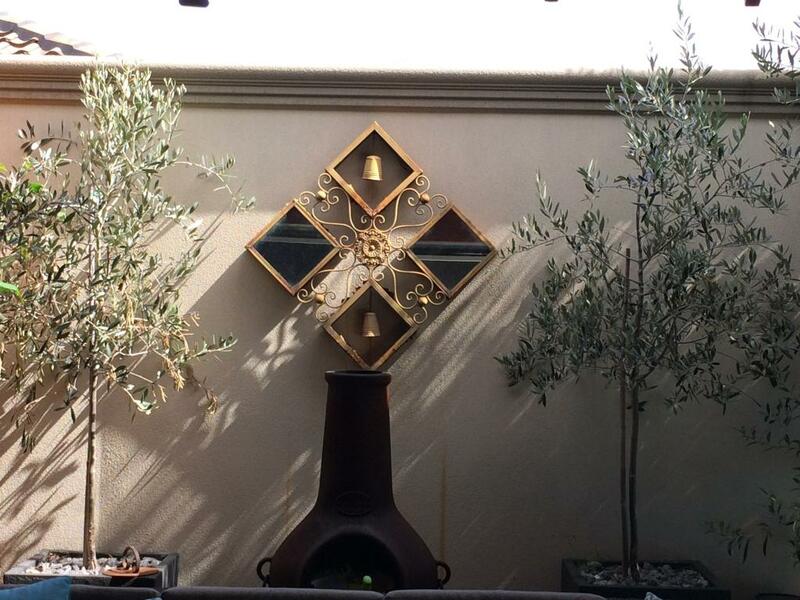 The garden wall is finished with a decorative moulding, creating a sophisticated, quality feel within the space. The light weight mouldings supplied by The Finishing Touch are made from computer cut high grade EPS polystyrene, which are then triple coated with a multi-part compound and reinforced with a triple coating of sand for maximum strength and durability. The beauty of this process is that the mouldings will not crack, shrink, expand or bend. Not only that, they are installed by certified installers which carries a 7 year warranty on all fixing. As the decorative mouldings have been finished in primer at the completion of the manufacturing process, they are ready to paint, which can be done 24 hours after installation is completed. The installation team uses a render patch system which virtually eliminates any sign of joins. With a range of styles to choose from such as French Provincial, Edwardian, Georgian, Mediterranean, Tuscan, Art Deco or Modern The Finishing Touch decorative mouldings will add beauty, sophistication and a quality finish to your house or garden. If you have a special design you would like for your mouldings, The Finishing Touch can custom make bespoke decorative architectural mouldings for their customers. The Finishing Touch have some interesting projects underway, supplying decorative architectural mouldings to add pizazz to new homes and a classic look on an existing home. The addition of decorative mouldings to a post modern design home built by Udaya Homes in Kiewa Street, Ashwood will help create an impressive façade. The large home designed for modern living, with a pool in the backyard, theatre room and all the modern features today’s astute home owner requires, will feature five 450 high x 550 wide quoinings on the top storey at the front of the house on the east facing windows. A new dwelling in a new estate at Alfredton near Ballarat by D.R. Gordon Building is another project the Finishing Touch are currently working on. Situated at Ibis Gardens Court, decorative mouldings for window architraves and parapets are being manufactured and installed for eight windows on the top storey and eight windows at ground level. This large family home has five bedrooms, a study, rumpus room and three living spaces. Builders working on a home refurbishment at Inverness Way in North Balwyn have called on the Finishing Touch to supply window architraves and corbels to add a touch of class to all the windows. The efficiency with which the mouldings can be manufactured and installed, due in part to the light weight material, assists Builders deliver the completed overall build or renovation on time. These light weight mouldings are becoming more popular due to the efficiencies and ease with which they can be added to a building. Adding value, beauty and a quality finish to a house, the Finishing Touch have perfected the art of moulding in modern times.